BIG WIN: NOSB Says Hydro and Aqua ponics are USDA Organic! On November 1, 2017, thousands of farmers nationwide waited to hear if the National Organics Standards Board, an advisory body to the USDA, would decide that hydroponic and aquaponic farms could remain eligible for the USDA Organic certification – a process which allows products from these farms to carry the USDA Organic label. For years, hydro and aqua ponic farms have been certified as USDA Organic. But recently, this certification has been up for discussion. Ultimately, a majority of the Board recognized that expanding the organics program to be inclusive of various types of farming promotes innovation and smart resource use. This makes good sense, especially for a planet with a changing climate, and assorted challenges in reducing use of water, energy and space. Embracing assorted forms of sustainable agriculture makes for a resilient, inclusive and stronger food system for the U.S.
“We’re very pleased that the NOSB made the right decision by voting not to prohibit hydroponic and aquaponic farms from USDA Organic certification. Many products from these farms already carry a USDA Organic label and to now withdraw that would be irresponsible and confusing for consumers and farmers. 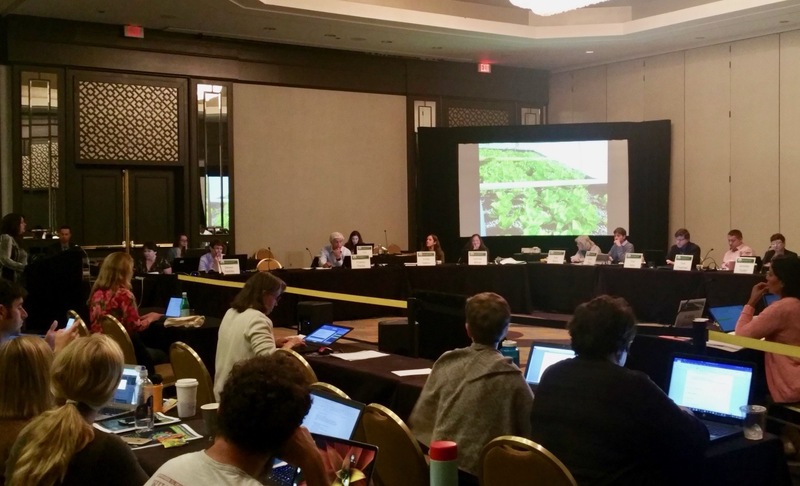 “By siding with current science and recognizing that existing law purposely leaves the door open for various farming methods, the NOSB is sending a critical message that sustainability and innovation are valuable in U.S. agriculture. These goals are at the center of the nationwide local food movement and spur growth of urban and rural farms alike, by a wide range of people. Inclusiveness is important in our food system. Read Marianne’s comments to the NOSB here.